Darwin and Theories of Aesthetics and Cultural History is a significant contribution to the fields of theory, Darwin studies, and cultural history. 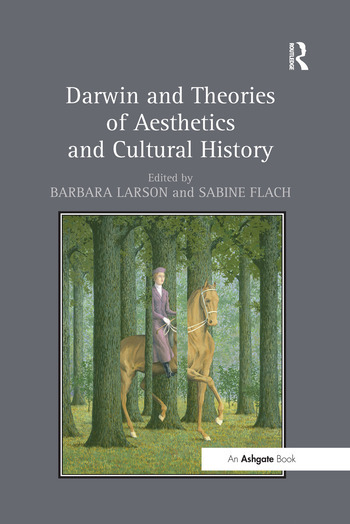 This collection of eight essays is the first volume to address, from the point of view of art and literary historians, Darwin's intersections with aesthetic theories and cultural histories from the eighteenth century to the present day. Among the philosophers of art influenced by Darwinian evolution and considered in this collection are Alois Riegl, Ruskin, and Aby Warburg. This stimulating collection ranges in content from essays on the influence of eighteenth-century aesthetic theory on Darwin and nineteenth-century debates circulating around beauty to the study of evolutionary models in contemporary art. Contents: Preface; Introduction, Barbara Larson; Darwin, Burke, and the biological sublime, Barbara Larson; Why is the peacock's tail so beautiful?, Laurence Shafe; Art's "contest with nature": Darwin, Haeckel, and the scientific art history of Alois Riegl, Marsha Morton; Cultural selection and the shape of time, Larry Silver; The evolution of culture or the cultural history of the evolutionary concept: epistemological problems at the interface between the two cultures, Sigrid Weigel; Communicating vessels; on the development of a theory of representation in Darwin and Warburg, Sabine Flach; On mimicry in Darwin and surrealism, Jan Söffner; Contemporary art and the aesthetics of natural selection, Ellen K. Levy; Index. Barbara Larson is Associate Professor of Art History at the University of West Florida. She specializes in intersections between art and science in the nineteenth and twentieth centuries. Her publications include The Dark Side of Nature: Science, Society, and the Fantastic in the Work of Odilon Redon (2005), and The Art of Evolution: Darwin, Darwinisms, and Visual Culture (2009), which she co-edited. Sabine Flach is currently Professor of Contemporary Art and Art Theory at the School of Visual Arts, Department of Fine Arts, New York City. She specializes in modern and contemporary art, aesthetics, aesthesis, and media of embodiment; habitus in habitat; the epistemology and aesthetics of visual thinking; and intersections between art, art theory, art history, and cognitive, neuro-, life sciences, and perceptual psychology. Her publications include: Habitus in Habitat I: Emotion and Motion (2010), Habitus in Habitat II: Other Sides of Cognition (2010), and Habitus in Habitat III: Synaesthesia and Kinaesthetics (2011), which she co-edited, as well as Sensing Senses. Die WissensKunste der Avantgarden. Kunstlerische Theorie und Praxis zwischen Wahrnehmungswissenschaft, Kunst und Medien. 1915-1930 (2013).